This tutorial is on How to Root Galaxy S8 Plus running Android 7.0 Nougat Official Firmware via CF-Auto-Root package by Chainfire. This package will allow you to gain full root access on your Galaxy S8 Plus with which you can modify your phone the way you want. Chainfire Auto root tool is now fully compatible with Samsung Galaxy S8 Plus (both Exynos and Snapdragon version). The list of supported device models is given below. Make sure to check out your model number before proceeding to the tutorial. UPDATE: If you are on Android Oreo, please follow this guide on How to Root Galaxy S8 Plus on Android 8.0 Official Firmware. This guide has been written very carefully so that you don’t mess up with any step while rooting. If rooting is not a new thing for you, this tutorial won’t be much difficult. But for a safe side, we recommend you to Backup all your important data and apps before moving to the steps. Sponsored: If you often use free Kodi add-ons to watch movies and TV shows, then you must have faced an error called Openload Pair. You can fix this Olpair error easily if you read the guide carefully. If flashing via Odin is not a new task for you, this guide would not be much difficult. We have covered entire step-by-step tutorial so that a new user can perform the flash easily. You can quickly Root Galaxy S8 Plus running Android 7.0 Nougat Official Firmware using the tutorial below! Chainfire is the most trusted team to provide a root package on Android Phones. Samsung users are using CF-Auto-root packages for many years due to the continuous support from the development team. CF-Auto-root works well in the Galaxy S8 Plus too and probably the best method to gain root access on this phone. Compatibility, reliability and security are the best things on CF-Auto-Root. Make sure you have correctly installed Galaxy S8 Plus USB Driver on your computer. If not, please download it from our USB Driver Section below and install it correctly. Otherwise, your computer will not detect your device. Before starting the tutorial, we strongly recommend you to make a full backup of your phone. Otherwise, you may lose your important data while rooting. If possible, take a full Backup via Samsung Smart Switch or pick an App from the Top 10 Best Android Backup Apps – to Secure your Data. Make sure to backup your data before proceeding to the tutorial. This method works on Android 7.0 Nougat and all future updates as well. 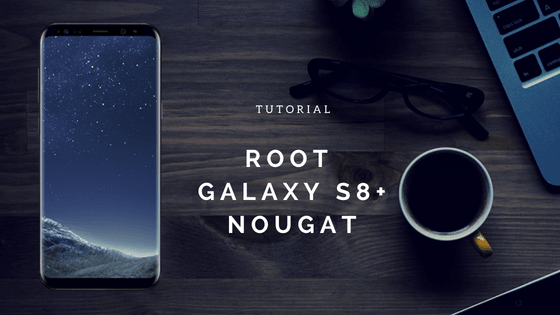 We have mentioned full step-by-step instructions on How to root Galaxy S8 Plus on Android 7.0 Nougat Official Firmware. If you are entirely new to rooting, flashing a Custom ROM or an Official Firmware, please read the entire tutorial once before actually performing it on your device. Step 3: Turn off your phone. Now go to the Odin Mode. How? Press and hold Volume down + Power + Home button until you see a warning message. Press Volume Up to enter the download mode. Click on ‘AP’ and select the extracted file. Step 9: Once the installation is complete, your phone will reboot into recovery mode automatically and install the root package. ID:COM box will turn into green colour. Unplug your device, when you see your home screen and you are done! NOTE: Sometimes, the phone does not get into recovery mode due to some error in the process. If this happens, do the entire series of steps again, but this time, make sure NOT to check “Auto Reboot” option in the Odin. Pull out the device battery to turn off the phone forcefully. After that, boot your phone with Power + Volume Up + Bixby buttons and to the recovery mode manually. This will start the package installation process. That’s it! Hurray! Your Galaxy S8 Plus has been rooted on Android 7.0 Nougat Official Firmware. Check the SuperSU App in your App list to verify. To make sure you have rooted your device successfully, and it’s working fine, verify with any root checker app or try out our cool collection of Top 40 Android Apps for Rooted Devices. Does this work for the usa version of galaxy s8? Can you please mention the model number of your phone? Anything for 955U from sprint? This will not work for ANY North American version of S8 (+). 955U, 955W etc. The bootloader is locked on these Snapdragon devices and this method will NOT work. I see the package for G955U, though it’s not listed in the supported models list. Can it be rooted or not? In the article you are talking about S8 plus but you refer to it as G950, and we all know that s8 plus is G955. Is it safe if I try your method on my SGS S8 plus (G955F) ? Thanks for pointing out. The device list has been updated, and yes, you can follow the tutorial for your G955. It’s completely safe to work on. Dose this work for Sm-G955U model ? Does this works on SM G955W Oreo 8.0? Yes, it will work. Make sure to follow the guide properly. Hi Partap. I have the same model phone as you. Did you get this to work? Yes, it will work on SM G955W. The links for AF Root packages are updated in this posts. Please recheck and try! This tutorial is for Galaxy S8 Plus only. You can try installing TWRP recovery using this guide: Install TWRP on Galaxy S8 [all variants] Custom Recovery! and then, flash SuperSu using TWRP custom Recovery. The model I own is Galaxy S8 Plus SM-G955FD. Qual Devo installer? Equal Flash TWRP Recovery Devo installer? The tutorial will work on Galaxy S8 Plus G955FD. We don’t have any tutorial for Devo Installer! Will this method install TWRP recovery in the phone? Or is there any way to install Xposed after root? If you want to Install TWRP Custom Recovery on your phone, check out this guide: Install TWRP on Galaxy S8 Plus Custom Recovery! Did you installed Samsung USB Driver on your PC? SM-G950U is Galaxy S8. This tutorial is only for Galaxy S8 Plus. Make sure to recheck the device list. I have the 955U Verizon S8 Plus running oreo 8.0 I didn’t see a 955u on the list. Device list Updated. Galaxy S8 Plus 955U Verizon added to the list. Please recheck and try! Yes! It’s already listed in the tutorial! Is this only for plus ? Yes, this tutorial is only for Galaxy S8 Plus! SM-G955U Is my model number. Its a S8+ on verizon. But its listed as 955V on the site will it still work? Yes, it will work. The device list has been updated. Please check! You say this is only for the Galaxy S8 Plus, but the standard S8, model SM-G950F is listed in step 1 as a download. What is the correct compatibility with this method!? Device list updated! Please check! Working! Now good. Thank you! I have tried a couple of times to no avail. I am Using a S8+ SM-G955W and I have dl’d both ODIN and the CF Root file from here. I am getting the following dialog in ODIN. Thoughts? Make sure you have downloaded the correct CF-Auto-Root file. We have updated the Download links today! and try the tutorial once again! I have the same ODIN dialogue like Chris. My model is SM-G955F. The screen shows “downloading, do not turn off target” . I downloaded the “CF-Auto-Root…smg955f”, which should be correct. What shall I do now? Tried it on Samsung S8+ SMG955U and followed direction but it failed! The log says fail sha256 is invalid. Im getting the same thing. DId you get a fix? No fix that I have found! According to the link, it was uploaded 12 months ago. I don’t think that is oreo. It does not work with S8+ SM-G955W Rogers Canada. Has anyone else with Roger’s not been able to root with this method? Or is it fixed now? Has anyone else had the same issue with Roger’s? Or has the issue been fixed? Unlocked OEM is necesary to activate?? Does this root method trip Knox? I still want to be able to use Samsung Pay. Thanks! Did you find out if this method trips knox? I attempted this with an SM-G955U using the one listed for the device, I keep getting FAIL! SHA256 is invalid. Is there a fix for this? Hi, I have an SM-9550, will this work on that too? If so, which of the four package will I use? Thanks! Before I chance to brick a thousand dollar device can you please let me know if this will work on my factory unlocked G955U1? Thank you! ? I have the same G955U1, did you tryied? Did it work? Model number is SM-G9550. HK variant. Model number SM-G955W on Telus network and will not work. Keep receiving FAIL message after attempting to load the package from Odin. Tried not auto-rebooting, however, cannot remove battery form S8+. Please help! Hi, my model number is SM-G955F and for some reason, Odin will fail halfway through and the log doesn’t show why. I was wondering if you had a solution. Is SMG955U from t mobile supported? “Odin version error” on phone after i start odin. The link for the SM-G955U says it was uploaded 12 months ago. I don’t think that file is for oreo. I have an ATT G955U1, Does anyone have tried, what are the results ? What shall I do now? Thanks for help! The same for me. Any issue? I get this error. I tried different version of odin and still nothig! Post Updated with all new download links (Exynox Model ONLY).